This dog was abandoned because the owner moved from an evacuation center to another house. When it comes to saving animals such as dogs and cats from the disaster, they all too often suffer the secondary disaster of abandonment, a fate that frequently befalls them in the afflicted area and in the evacuation center of the disaster. Now it is considerably more difficult for dogs and cats to survive the disaster, even if they were saved by the owner. Many of people who lost their homes and property in the disaster are in evacuation centers with their animals, because they know the animals are a huge comfort to them in these times and give them a cause for hope in the aftermath of the disaster. The dog pictured above was difficult to catch because he appeared to have a mistrust of humans. Actually, he escaped when we tried to catch him. It’s a great pity to see such behaviors, not just cause by the disaster but also as a result of being abandoned by his owner. He was spotted looking for food for more than two weeks, sometimes at distances of 5 km away. The site where he was found is in a middle of mountain in Iwate. The town looks like a place that has been bombed. A major fire occurred after tunami, leaving the site and the mountain burnt and completely destroying all life in the place. “The situation in Japan is a catastrophe, but I want to ask whether the owner tried to find a new home for his dog before abandoning him. If he didn't, and also if he was not able to find a way to live with his pet, he does not deserve to have other pets in the future. Fortunately, small numbers of them are saved, but almost all would be dead if they had been abandoned,” said Ren Yabuki, a director of LIA. When he first met the dog, it was at night, and a member of the Self-Defence Forces helped him to try to catch the animal for about 90 minutes, but they were not successful. 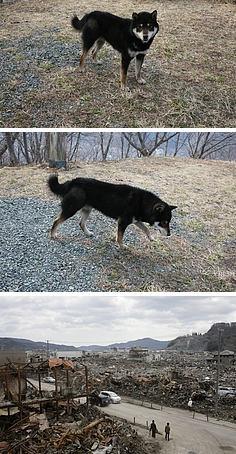 An organisation, Doubutu Inochinokai (http://www.inochinokai.com/ ), came to Otuchi (Iwate) all the way from Morioka (Iwate) to help him catch the dog with humane traps. He tried to catch the dog with all methods available except tranquilizer gun, because he know the anesthesia is could be harmful. He tried to acclimatise the dog to a human presence every day and at last he caught it by hand. “In this case, I am thankful to many people who gave me lots of information about the dog,” said Ren Yabuki. “Also to the disaster countermeasures office of the evacuation center, where they picked up the topic and alerted many people in their meeting. I hope the dog will be happy with his new owner. The true meaning of ‘animal rights’ and ‘animal lovers’ is to think of the animal’s life as you would think of your own. Is that the true reason why like animals? Are you sure you are able to protect an animal’s life forever? Because if you have animals, their lives are completely depending on your care. We operate a charity for the disaster. Please join us now!